Unfortunately the legal basis for the class-action lawsuit had not yet been established: seems that everyone could do whatever he or she liked! But monochrom endeavored to find out exactly and put the trademark knowledge of the bourgeois art world to the test. 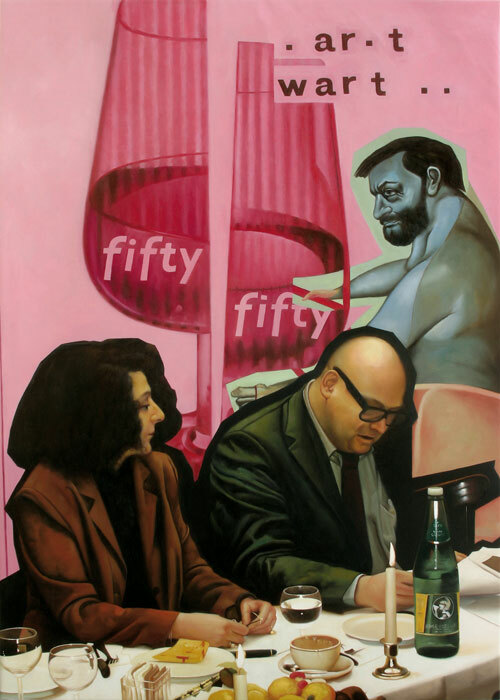 At the end of March 2006 Teyssandier-Springer called a press conference at the Berlin Café Einstein with a text using systematically diffuse wording to announce “new value management involving Kippenberger” – which turned out to be a suitably cartoonish carrot for getting the art world moving. The proof was a gallery owner from Miami, who expressed his intentions to come and was ready to book an airline ticket to Berlin, only to be prevented from doing so by a specious evasion from monochrom, allegedly out of pity. The press conference in Café Einstein was meticulously planned, including a costly buffet and accompanying program, and it was precisely executed before an auditorium whose emptiness met all expectations. A few waiters were the only people in attendance at the nonevent presented by Orhan Kipcak and Silvia Bandini. And yet not even a whole two weeks later 4,231 downloads and 2,120 half downloads of an MP3 recording documenting the proceedings had been registered (www.teyssandier-springer.com/lordjimloge/recording_lgl_conference_berlin.mp3).